At Fitness Matters Jimboomba we LOVE GROUP EXERCISE! 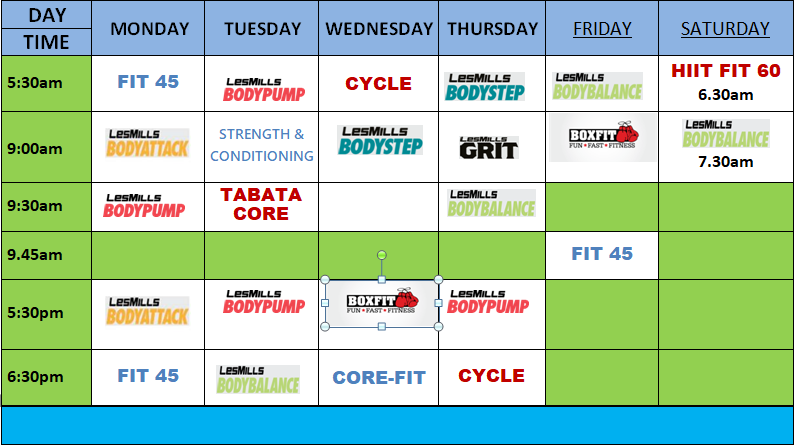 The majority of our Group Fitness Schedule is programmed by Les Mills©, the World-leading New Zealand based fitness company whose programs get over 5M people moving on every continent, every week. Which Les Mills program is for you? Using light to moderate weights with lots of repetition, BODYPUMP gives you a total body workout. It will burn up to 540 calories*. Instructors will coach you through the scientifically proven moves and techniques pumping out encouragement, motivation and great music – helping you achieve much more than on your own! You’ll leave the class feeling challenged and motivated, ready to come back for more. BODYPUMP is available as either a 30 or 60-minute workout. BODYATTACK is available as either 30 or 60-minute workout. BODYSTEP is available as either a 30 or 60-minute workout. BODYBALANCE is available as either a 30 or 60-minute workout. Hatha Yoga creates harmony within the body, mind and spirit, this is through a holistic approach. There are many benefits of this authentic form of Yoga including; increased mobility and flexibility, creating a mind/body connection and teaching you relaxation techniques, all of which reduces stress both on and off the mat and provides the participating individual with an over all feeling of increased wellness and vitality. Hatha Yoga caters for all levels of fitness. Feeling fitter, stronger and more alive has never been more achievable or more enjoyable! Incorporating all elements of fitness, our in house, freestyle CIRCUIT program will increase your cardio fitness, build your strength and improve your balance and flexibility. All in a supportive group environment, with motivating music and caring instructors. This is a fantastic in house, fresstyle program where you will learn correct boxing technique as well as getting a great workout. It incorporates cardio and resistance and is suitable for beginners to advanced trainers. Using tabata training principles of 40 seconds work and 20 seconds rest, this workout will strengthen your core and have those abs looking fab in next to no time. If you think core work is easy you haven’t tried this!